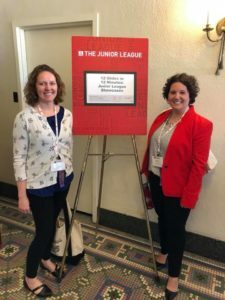 Born and raised in the Dayton area, Jessica Stickel attended The Ohio State University where she earned both her Bachelor of Arts and Master of Education. This proud Buckeye couldn’t resist the Gem City, though, and returned to Dayton to accept a job at Kettering Fairmont High School where she continues to teach English and advise the yearbook staff. When she’s not grading papers or proofing pages for their award-winning yearbook, Jessica enjoys volunteering (especially with the Junior League of Dayton), running, and traveling with her family. Jessica joined the Junior League of Dayton (JLD) in 2011. Prior to being nominated as President-Elect, she enjoyed serving on both the Community and Financial Development Councils in several different roles. Jessica’s roles included the Healthy Families committee, chair of the 5K/10K, Treasurer, and Community Council Vice President. Some of her favorite JLD experiences include chairing the incredibly-cold 2013 Run for the Health of It 5K/10K when her son was exactly 1 month old and driving her car inside the Gray America warehouse before the first Vintage in the Valley rummage sale. Jessica is proud to have served on Community Council as the JLD rolled out the Learn Grow Explore literacy initiative and is excited for continued growth in this area. Additionally, Jessica has served on the Associate Boards of the Dayton Art Institute and the Boonshoft Museum of Discovery and is a 2018 graduate of Leadership Dayton. A mother of adorable, curly-haired, and strong-willed children, Jessica is passionate about making sure that Dayton is a strong community where future generations will want to live, work, and play. Jessica and her husband, Jeff, reside in Kettering with their three children. Erin McNicholl (pictured left) was born and raised in Miamisburg, Ohio. She is currently employed at Brown and Bills Architects, where she has worked as a project architect for the last six years. Erin earned her Bachelor of Architecture from the University of Detroit Mercy in 2003. After spending a number of years working, she returned to graduate school at Clemson University/College of Charleston where she graduated with a Master of Science in Historic Preservation. 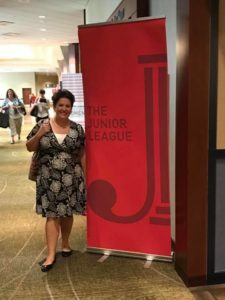 Erin has been a Member of the Junior League of Dayton since 2013. Since joining she has been a member of every council and spent three years on the executive board, serving as Treasurer and Recording Secretary. In addition to the Junior League, Erin serves as a member of the City of Dayton Landmarks Commission where she helps to oversee the historic districts in the City of Dayton. Join the Junior League of Dayton! Interested in joining us in our mission to impact the Miami Valley community? Click here to learn more about joining the Junior League of Dayton!